You are here: Home / Blog / Leadership / How is your Worship Team “Really” Doing? Whenever we take regular time (I’m talking about once a month) to back up and objectively ask, “How are things really going right now?” we’ll often find that some areas of our team that we thought were very strong, actually have a few holes in them and need our attention. Getting on the balcony lets you know that you still have some work to do on that area. You will likely find that this area has improved and so now you can turn your attention to another area of growth. If your team feels stagnant, like you haven’t tried anything new for God in awhile, chances are you haven’t gotten on the balcony much lately. When you regularly remove yourself from the daily race to spend some time examining your team, you find you also have time to dream and plan. Some of our most creative worship expressions at The Journey have come out of some personal balcony time where I put down my to-do list for an hour and went to work on my ministry rather than in my ministry. If you feel like you’re in a rut right now, you need some balcony time! The problem is . . . very few worship leaders EVER take time to do this! In 14+ years of ministry at The Journey and 10+ years of coaching worship leaders I’ve found that the key to getting from where you are to where you want to be is to create monthly balcony time. In my coaching networks, that is the #1 benefit that worship leaders experience… a reason to get on the balcony every month. That’s the power of Getting on the Balcony. So let me ask you a few questions to help you get started . . .
#1 – Do you have a system for creating balcony time every month? #2 – Or better yet . 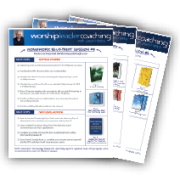 . . what if you had a system to evaluate your worship ministry every month with me and a group of other worship leaders who are all committed to seeing God’s very best in our churches? #3 – What if you had a way to unplug from the hectic pace of ministry every month and get laser-focused on how to bring health to the most important areas of your team and overcome the BIG challenges that you’re facing right now? #4 – What if you had a coach / mentor / friend to walk beside you, answer your questions, share feedback, pray for you and help you implement the changes that you know are needed for you to serve your church at the highest level without burning out over the next year? That’s exactly what my coaching network is all about. And I would be honored if you would prayerfully considering joining. But — you need to prayerfully consider soon, because 2016 is slipping away quickly and I have only a handful spots available. I’d love for you to have one of them! 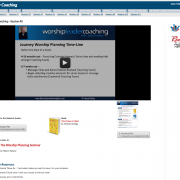 Go to www.WorshipLeaderInsights.com/Coaching, complete the 60-second online form and we’ll get started immediately developing YOUR strategy for a healthy and growing worship ministry! I hope you’ll allow me to get on the balcony with you! Where’s the Slack in your Worship Team? Don’t Finalize Your Easter Set List Until You Read This!